Genuine OEM HP Waste Toner Collector, 36,000 page yield. HP part number: CE265A. 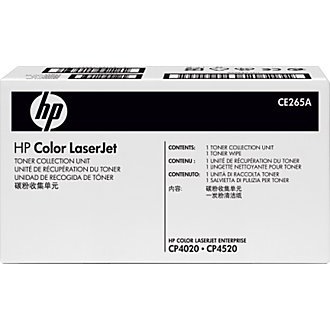 Waste Toner Collector compatible with HP LaserJet CM4540, CP4025, CP4520, CP4525. I generally empty and reuse these myself but with a huge job I ordered a spare so I could have a second one on hand and ready to go when I needed it. Fair price, exactly what I needed.